The 2019 ceremonies shall focus on the theme Pagkakaisa sa Pagkakaiba-iba: Kalidad na Edukasyon para sa Lahat (Unity in Diversity: Quality Education for All). Schools, schools divisions or regional offices may translate the theme into their respective Mother Tongues. This theme highlights the role of the K to 12 Basic Education Program in developing an educated society where the challenges and benefits of diversity are embraced and welcomed by every Filipino. As announced in Enclosure No. 2 of DepEd Order (DO) No. 25, s. 2018 entitled School Calendar for School Year 2018-2019, the EOSY rites should be scheduled not earlier than April 1, 2019, but not later than April 5, 2019. Schools, divisions or regions with an extended SY shall be guided by their approved revised school calendar. c. Nonacademic projects such as attendance to field trips, film showing, Junior-Senior promenade, and other school events should not be imposed as requirements for graduation or completion. Maintenance and Other Operating Expenses subject to existing guidelines. No DepEd personnel shall be allowed to collect any kind of contribution or fee for graduation/moving up/completion ceremony. 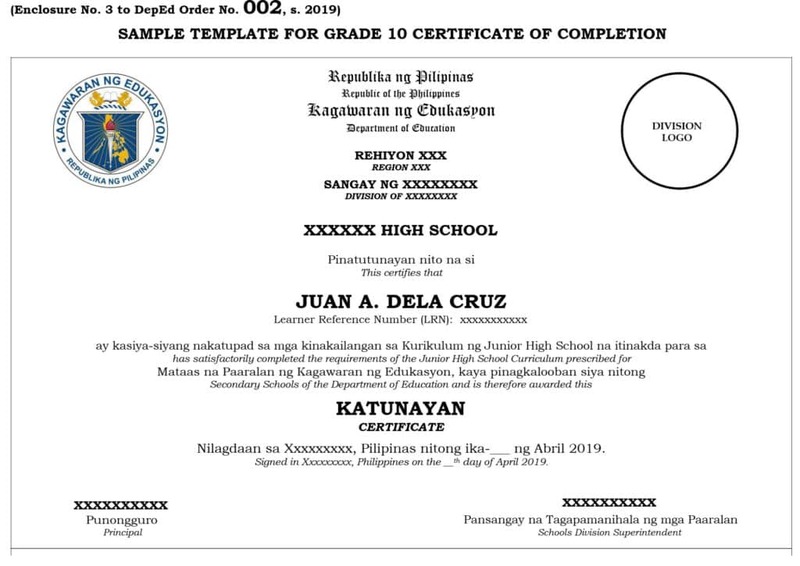 For private elementary and secondary schools, technical and vocational institutions (TVIs), and higher education institutions (HEIs), including state universities and colleges (SUCs) and local universities and colleges (LUCs) The use of the enclosed completion certificate and diploma templates is optional. The signature of the school head is required, while the signature of the schools division superintendent is not required. Awarding of honors to learners from Grades 1 to 12 shall follow the guidelines in DO 36, s. 2016 entitled Policy Guidelines on Awards and Recognition for the K to 12 Basic Education Program. Further, the EOSY rites and moving up or completion ceremony shall be conducted in an appropriate solemn ceremony befitting the learners and their parents and shall not be used as a political forum. DepEd reiterates the strict compliance with DO 48, s. 2018 entitled Prohibition of Electioneering and Partisan Political Activity. sana po tanggapin din po sa kinder yung mag five years old ng month of november provided na marunong na yung bata at gustong pumasok sa paaralan. Thanks for sharing it sir mark..